We build performance management and performance assessment systems based upon key behaviors that are crucial to organizational performance. 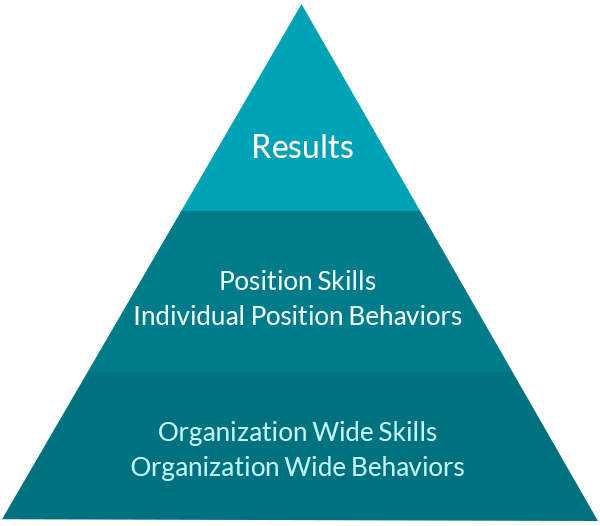 Using established behavior assessment tools (DISC Assessment, StrengthsFinder, The Five Behaviors) and an in-depth investigation of organizational culture, we design a performance model which identifies both behaviors and skills which are crucial to success in your organization. The performance pyramid identifies both organization-wide and job specific behaviors and skills. This process focuses on how people behave as the foundation to performance and recognizes that skills can only be leveraged if behaviors are in place. Establish behaviors key to organization success. Via the use of assessment tools, individual interviews, and group facilitation, identify behaviors crucial for all members of your organization. Through individual interviews and group facilitation, identify skills that all members of your organization should possess. Audit each individual position in your organization. Identify additional behaviors that are required for each position. Articulate specific skills needed for each position. Identify specific job outcomes and work products for each position. Build job descriptions for each position that focus on behaviors. Build performance assessment processes that include behaviors, skills, and outcomes. I have worked with McIntyre-St. Clair as Assistant City Manager and City Manager for the City of Glendale. From executive level leadership training to strategic planning, I have been extremely impressed with their results. The most recent program’s mix of theory and practical approaches to leading complex organizations was appreciated by program attendees. I've worked with McIntyre-St. Clair as City Manager in both Burbank and South Gate. Their ability to listen, engage, and facilitate solution development is second to none. Ready to move your organization to the next level?